Hi everyone, I’m Emma from the blog Emma etc. Sarah and I decided to share our favourite feminist reads in a collaborative blog post, so after reading this post you can head on over to my blog to check out Sarah’s selection of books. I often talk about books on my blog as well as other topics like beauty. I love recommending my favourite things so without further ado here are five great feminist books to read. This was my first dip into the world of feminism and after reading it I felt so angered but most importantly, inspired. Reading this book is so eye opening and I whole heartedly recommend you pick it up. It’s not a light read as per say, as it deals with some pretty serious topics and includes some, quite frankly, frightening statistics about sexism is this day in age. This isn’t a book to read all in one go, but to dip in and out of, or read one chapter at a time. Overall I’m so glad I read this as it started a love of feminist books and made me want to do something about issues in society. Following on from Everyday Sexism, Girl Up, by the same author, is targeted more at a younger audience. Instead of the saying ‘Man Up’, the author is encouraging girls to ‘Girl Up’ and start calling out or doing something about sexism. She discusses different topics many girls in the teen years have or will deal with, in a pretty humorous but inspiring way. You can get a taste for the book from reading some of the back cover - “Warning: This book contains feminist limericks, colour-by-numbers genitalia and dancing vaginas.” It is unapologetically addressing what many girls go through. Less self-loathing and more fist-pumping. Steering away from the non-fiction, this book is a short but wonderful observation of the sometimes subtle differences between girls and boys. If you’re observant, you’ll see Sarah also has this book on her list. It’s really that good and has some of my favourite quotes in it. Frankie is a very sassy, smart girl who basically starts investigating a secret boys society set up in her school, and begins questioning girls are perceived a certain way while boys aren’t. This is honestly one of my favourite books and combines young adult fiction with some feminism which I am all for right now. This is the second book in the Spinster Club series which Holly Bourne has dreamed up. The club is one where three girls essentially discuss feminism and eat cheesy snacks - I can’t think of anything more wonderful. Amber, one of the girls, leaves her home in England and goes to visit her Mum who lives in America. She helps out at a summer camp and in the process finds herself pondering about love and family, and of course, how feminism fits into all of that. This read combines a good ol’ slightly fluffy romance and a touch of feminism to make the ultimate summer read, or practically any time of the year. 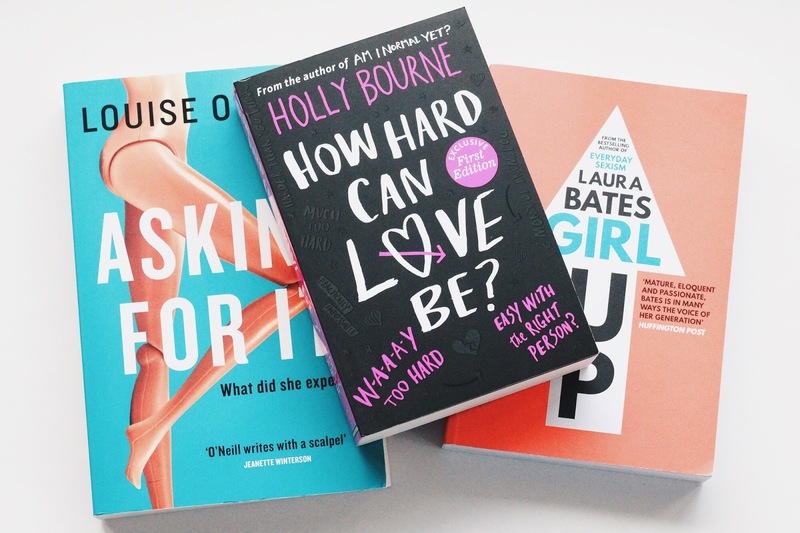 Holly Bourne has said she wanted to ease her readers into feminism with each book in the series, so get reading to start the ultimate finale What’s A Girl Gotta Do? which has recently been released. This was the ultimate forage into the very serious and timely topic of victim-blaming and sexual assault. I have come to love Louise O’Neill and her passions about feminism since reading this, and I feel like this is necessary reading if you’re interested in all things #fem. Asking For It was indeed a very shocking and realistic book, one that I don’t think I necessarily enjoyed all that much. The reason I am recommending it is because it is such a realistic look into how victim-blaming effects a person. It’s honestly hard to read at points, but it is so engrossing, particularly near the end. It’s not all happy endings in the real world, is it? I hope you’ve enjoyed hearing about my favourite feminist books, and you’ve found at least one you would like to read. Remember to check out Sarah’s feminist reads on my blog here. In the mean time, you can check out a Twitter group me, Sarah, and other bloggers are part of: @fem_collective. We’ll be hosting feminist chats very soon among other things.